As a healthcare executive, medical records requests create constant and competing priorities. 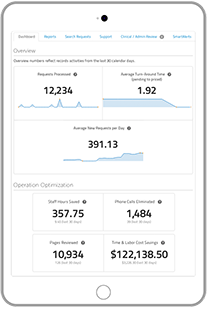 Increase operational efficiency while meeting stakeholder needs with ChartRequest—a release of information technology that’s easily implemented with little resources required from your IT department. Our HIPAA-compliant platform cuts expenses while streamlining health information exchange—empowering your organization to reallocate your staff on mission-critical tasks and better serve patients. Put an end to costly status updates and reduce administrative expenses—such as printing records, mailing documents, and burning CDs. From records requests to patient authorizations, our platform reduces inefficiencies as all actions are submitted and fulfilled electronically with streamlined workflows. In addition, your organization will drastically decrease the time your staff spends answering questions on the status of medical records being processed. 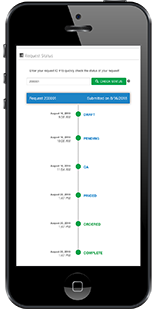 Your organization can simply redirect requesters to real-time updates available online and free up your staff for other tasks. The result? Blazing turnaround times, accelerated reimbursement, and improved cash flows. Empower your patients to easily request their records and monitor the progress of their documents. From the convenience of their computer—or even cell phone—patients can retrieve their records from your healthcare organization. In turn, ChartRequest will digitally process their requests, reducing turnaround times with automated workflows. When it comes to monitoring the status of requests, your patient population can also gain real-time visibility into the release of information process. With a few clicks, any patient can view the status of a request—reducing the likelihood of unnecessary phone calls or office visits. No longer worry about unauthorized disclosures. 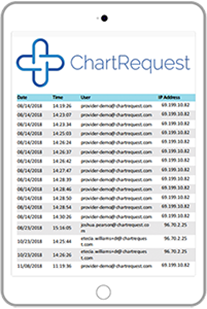 The ChartRequest platform is SOC 2, ISO 27001, and HIPAA compliant—eliminating potential missteps from mailing, faxing, or emailing protected health information. 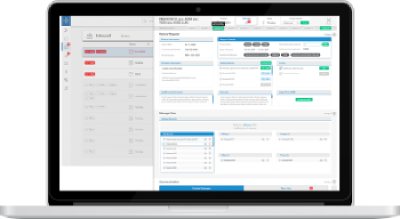 In addition, ChartRequest generates a full audit trail for each patient record. No matter the date, time, user, IP address, or action taken—our platform provides a detailed history of every record request for full transparency and accountability.